Solar Impulse, a solar powered electric driven aircraft, is on its way to Oahu Hawaii from Nanjing China. This is its 7th leg of an around-the-world flight and the longest leg. Over 5000 kilometers and 5 days of flight time. During the day, its 17,000 wing-mounted solar cells must charge up the lithium batteries to continue operation of the aircrafts electric engines over night until sunrise. The flight passes just east of Japan and then over the Pacific, just south of Midway island, all the way to the island of Oahu in the Hawaii chain. A cold front developed that was too dangerous to cross, and the flight team decided to make a stop in Japan to await the next weather window to attempt the rest of the run to Hawaii. View some images from the ARVO 2015 meeting in a Google+ photo storyboard. See link below. You can learn more about ARVO at their ARVO.org website. About 10,000 "eye" scientists and clinicians (professors, PhDs, graduate students, undergraduate students, post-docs, MDs) attend this five-day meeting each year. Traditionally for many years held in Sarasota FL, then for over ten years in Ft. Lauderdale, the meeting outgrew those centers and requires conference centers with accommodations close to the actual meeting. Seattle has been the best so far, Orlando was good, and Denver was up their with Seattle in my opinion. This month May (3-7) we met and talked and presented in Denver CO, one of the nicest pedestrian and bike friendly cities in North America. Vision scientists, while studying eyes, have tended to discover many things that are applied now in all areas of medicine and biology. The development of the "candidate gene approach" to guide the discovery of specific genetic mutations that cause inherited diseases, and most recently the first successful treatments of specific blinding retinal disease with gene therapy. Replacement of damaged retinal pigment epithelial cells (RPE cells) in elderly AMD patients using RPE cells made from embryonic stem cells (ESCs) and induced pluripotent stem cells (iPSCs, from skin) are in their first human clinical demonstration trials in the US and Japan. Frankly, its fun doing eye science, even though its a little work every day to hold down a professor/scientist job. If you like to explore the unknown and think and write and read alot, and repeat experiments until they work well, then its a good place to be. International meetings like ARVO are a way to recharge and become inspired to do on yet another year, sharing information with other researchers from all over the globe. Much Starbuck's was drunk in the downtown Denver area in early May, to keep brains alert. Cars and other technology heritage in Rochester municipal park today. Also quilting and yarn spinning demonstrations. Arts and crafts for sale and outdoor dining. Civil war and 1812 enacting camps with canon demonstration at 3 pm. We don't kill dandelions at our house. We like all kinds of flowers and I still like to blow those dandelion fluff-seeds and watch them float on the wind. I like a new high spring growth of grass and broad-leaves before the first cutting with a Scott's push mower. These manual mowers are no harder to push than a gas engine mower because the later are so heavy. The gas mowers also rip grass violently while the push manual mower cuts grass blades like scissors. More gently, more clean cut. We cut our grass leaving it taller than most lawns around us and thus more drought resistant. So no need to install and maintain a watering system. The mix of grasses and natural broad-leaves are more resistant to root grubs who chow down-under on manicured lawns of bluegrass. I want clover and I like the mosses on the shady lawn at the side of our home too. Birds chirp in our heavily flowered crab apple tree and honey bees go about their business. 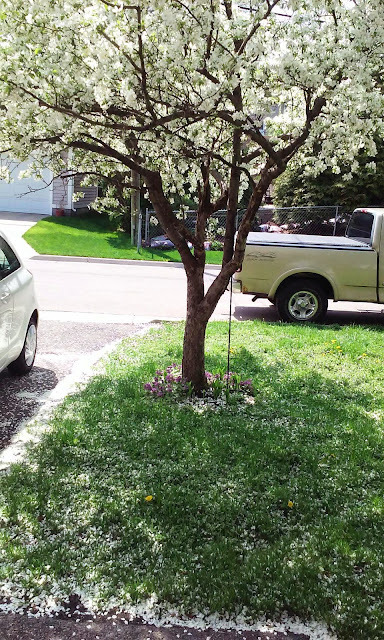 The blossoms are dropping petals like a snow on the lawn and my Yaris (car), which fly off my car as drive away like they are spread at some wedding. Who needs chemicals for their yard? Who wants to look at a flat, monotonous, golf green that is not actually used for golf or lawn bowling?